The photo was taken by Audra Zaba at www.audrazabaphoto.com. Indie Gift Box is a great way to celebrate new Indie artists by receiving a box in the mail full of fantastic themed surprises! 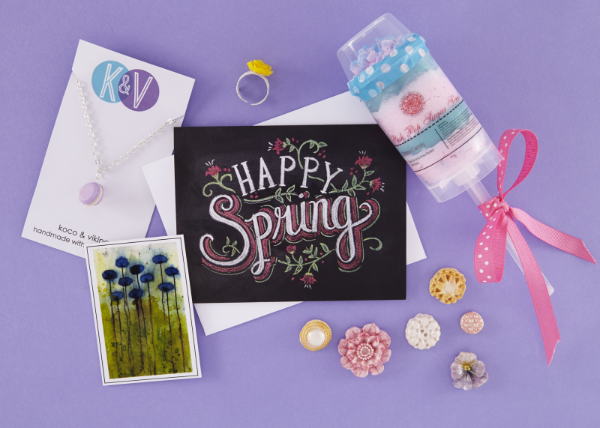 I was thrilled to receive their Spring box full of great Spring celebration items. These handmade items are unique and so fun to see in this Spring Themed box.
" True to our roots and desire to be starkly different from other monthly boxes, we still do not require a subscription, but we do offer a variety of loyalty benefits and rewards that increase with the length of customer commitment. Indie Gift Box subscriptions help us to streamline our systems, personalize customer service, and lavishly reward our devoted Indie Mavens. It's a win! " Subscription customers get served first and with only 75-100 boxes per month, it definitely pays to have a subscription to ensure you get these great products each month. So what did I get?? The same day I got the box I had to try out My Lucky Dragon's body scrub! It looked so fun. It was a nice and soft, and wonderfully smelling scrub. I think I may need another bath! Darling ring from Mercantile519! With the open back on the ring it can fit on any finger. I really loved this ring, and it sells for only $5, can't beat that. When I first saw this product from Marion's Vintage Bakery, I thought what cute embellishments for making cards or scrapbooking. I obviously didn't read the title on it first. Then I realized they were edible! Very intricate, and detailed. Imagine these beauties on a cupcake or cake decorating in vintage decor. Koco and Vikings send this cute French macaroon necklace. This looks like a mini cookie doesn't it? I am going to give this to my niece for her birthday, she will just love it. Popwheel Art sent a trading card that you could stick in a little magnet frame or put a magnet on the back for your fridge, and these little stickers to decorate an envelope or put a personal touch on correspondence. Happy Spring card from Lily & Val will be great to send out to a special loved one. I know my Grandma would love to receive a card in the mail. Not everyone sends emails! I think the My Lucky Dragon body scrub looks wonderful, as well as the Koco and Vikings necklace! The KOKO and Viking pendant is really pretty. I totally adore the French Macaroon necklace! so cute! I really love the Koko and Viking necklace and the Popwheel art card. I really like the KOCO and VIKING – pastel French macaron necklace pendant on a silver plated chain and Popwheel Art – watercolor floral art collector card with matching stickers.